Mitch McConnell says Senate will vote on Graham-Cassidy health care bill next week. 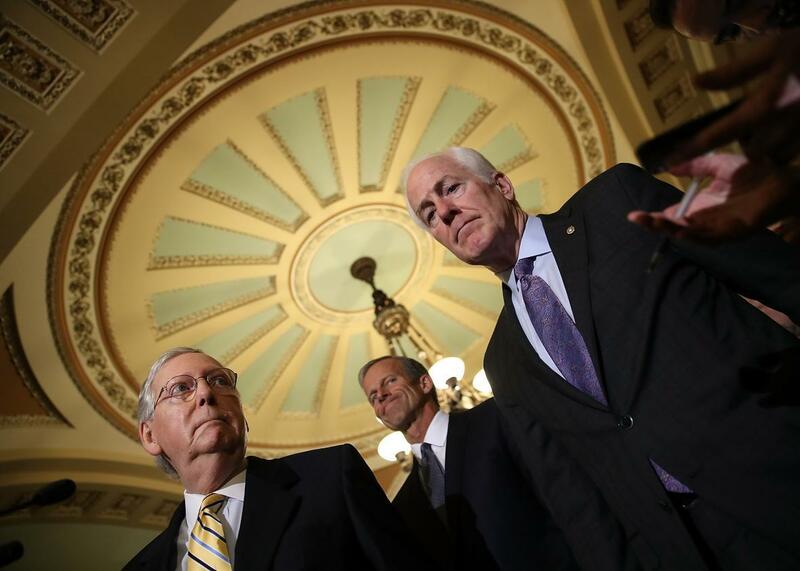 Senate Majority Leader Mitch McConnell, left, with members of the Senate Republican leadership on Sept. 12. A spokesman for Senate Majority Leader Mitch McConnell has said “it is the Leader’s intention” to have the Senate vote on Graham-Cassidy next week, according to Politico. The bill, crafted by Sens. Bill Cassidy and Lindsey Graham, would replace Obamacare’s subsidies and Medicaid expansion with federal block grants to the states to establish their own health insurance systems. For the past several days, the GOP vote count had been stuck at 48 or 49, pending a change of heart by Sens. John McCain, Lisa Murkowski, or Susan Collins. It’s unclear whether McConnell now has one or more of those votes locked up now. The Senate Finance Committee will have the only hearing on the bill next week. The Congressional Budget Office is scheduled to release a “preliminary assessment” of the bill early next week without estimates of the bill’s effect on insurance coverage or premiums.